We investigated the antifungal susceptibility profiles of 207 independent Candida albicans strains isolated from patients with vulvovaginal candidiasis (VVC) in Xinjiang Province of China. 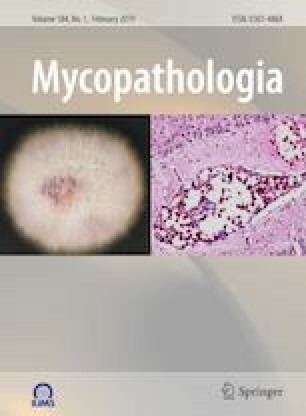 Using CLSI M27-A3 and M27-S4 guidelines, anidulafungin and micafungin were the most active drugs against C. albicans showing an MIC50/MIC90 corresponding to 0.016/0.0313 µg/mL, followed by caspofungin (0.25/0.25 µg/mL), posaconazole (0.125/0.5 µg/mL), ravuconazole (0.063/1 µg/mL), itraconazole (0.125/1 µg/mL), amphotericine B (0.5/1 µg/mL), isavuconazole (0.063/2 µg/mL), 5-flucytosine (1/2 µg/mL), voriconazole (0.125/4 µg/mL), and fluconazole (0.5/4 µg/mL). 96.1% (199)–100.0% (207) isolates were sensitive to the three echinocandins tested, amphotericine B and 5-flucytosine. The in vitro activity of triazoles against all isolates tested was variable; itraconazole and voriconazole had reduced the activity to almost half of the isolates (55.1% (114) and 51.2% (106) susceptible, respectively). Fluconazole was active against 76.3% (158) isolates tested. The new triazoles ravuconazole, isavuconazole and posaconazole showed good in vitro potency against 89.9% (186)–95.2% (197) of isolates with the geometric mean MIC (µg/mL) of 0.10, 0.12 and 0.14 µg/mL, respectively. In conclusion, our study indicates that for effective management of systemic candidiasis in Xinjiang Province of China, it is important to determine the susceptibility profiles of isolated C. albicans from patients with VVC. Liang Yan and Xiao-dong Wang have contributed equally to this work. The online version of this article ( https://doi.org/10.1007/s11046-018-0305-2) contains supplementary material, which is available to authorized users. This study was supported by Suzhou New & Hi-Tech IDZ grant 2017Z008, in part by Shanghai Science Foundation of China under Grant 16DZ0500401. Seyedmojtaba Seyedmousavi is presently supported by the Division of Intramural Research, National Institute of Allergy and Infectious Diseases (NIAID), National Institutes of Health (NIH), Bethesda, MD, USA.